Folding rowing machines are becoming more popular each year because more people are discovering their versatility and the excellent cardio workout they provide. 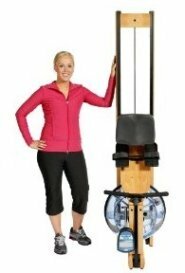 If you’ve always wanted an exercise machine of some type for home use but assumed your apartment, home or bedroom was too small, think again. Today’s portable, folding rowers offer the same quality workout that you can get from a stationary rower, but they can fold up or collapse down to be stowed away between uses. There are four different types of rowing machines that are available in folding models. The most common is the hydraulic or piston machine. These are generally portable and lightweight and can fold down to a remarkably small size. The hydraulic machines don’t give you the feel of genuine rowing, however, and can be a bit jarring on the joints. Magnetic resistance rowers are less expensive than models with air or water resistance systems, but they give a smoother, more comfortable ride than hydraulic models. Magnetic machines can also be folded or collapsed for stowing in closets or under the bed. Both air and water resistance folding rowing machines are at the higher end of the price scale, but deservedly so – they offer a more realistic rowing experience and are more comfortable and reliable than lower end rowers. Keep in mind, however, that water rowing machines require a rather large, filled water tank which can be both heavy and bulky. While there are a few folding water machines on the market, they still take up a considerable amount of space when folded. Weight. Some rowing machines have stainless steel frames; others use aluminum or wood frames. The material used can make a machine either lightweight (aluminum) or quite heavy (stainless steel). A water tank will also add a considerable amount of weight. If it’s too heavy, you won’t want to have to struggle with folding and moving it after your workouts. Components. Focus on the components that are designed to make your folding rower practical. Are the grips or handles used to move the machine comfortable and sturdy? 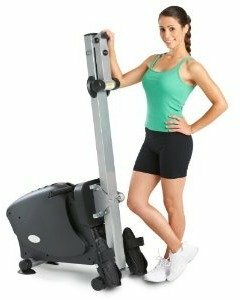 Does the rower have wheels so that you can simply roll the machine away? Is it collapsible? Some folding rowing machines fold but are still bulky and still take up a lot of floor space while others collapse into a surprisingly small footprint. If you plan on storing your machine in a closet, behind the sofa or under your bed, be sure to measure the rower in the folded position so you don’t end up bringing home a rowing machine that can’t be crammed into the intended space. What is the range of motion? Because folding rowing machines are designed to be smaller than stationary versions, some of them skimp on the range of motion. Be sure that you’ll get a full extension of your arms and legs when using the machine. You should also consider the weight limit. If you’re a hefty person, make sure the weight limit is high enough to accommodate you. The Lifecore R100 Rowing Machine is one of the best in its price range. Consumers and fitness gurus both appreciate Lifecore’s dedication to a top quality product, and this model folds up in just seconds. It uses an unusual combination of magnetic and air brakes. For a budget machine, consider looking at the Stamina Body Trac Glider 1050 Rowing Machine. It’s a piston rower for less than $200, and has a small footprint even before you fold it for storage. The steel frame is surprisingly stable at this price point. Users rave about the smooth, realistic feel of the ProRower H2O RX-750 Home Series Rowing Machine, a water rower that folds upright so you can store it in a closet or tuck it into the corner. Although you can’t hide it under your bed, it’s not as heavy as most other water rowers. With so many styles of folding rowing machines on the market, we’re sure you’ll find one that’s the perfect combination of size, convenience and features for your home workouts. Get the popular folding rowers on sale right now!